Very elegant and simple! This is a great gift! You can use it as a decoration at the shower and it can also be hung in the hospital room or a nursery! All diapers are 100% usable. 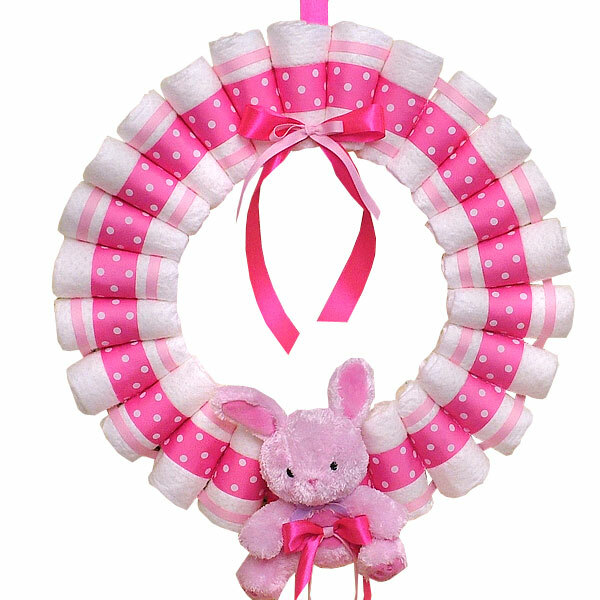 Diaper wreath includes 25 Pampers Swaddlers diapers size 1-2 (up to 14 lbs.) 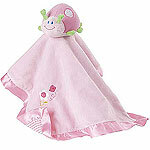 and a soft pink little bunny by CARTER'S. Approximately 16'' in diameter. Comes wrapped in cellophane with coordinating ribbons and bows. All our diaper wreaths made of highest quality ingredients with greatest care and love. Everything included is ready to use and easy to disassemble. For all our diaper cakes we use the highest quality diapers. Usually diapers from size one to size two used to build our cakes. We handle all the diapers with care and in absolutely clean conditions. 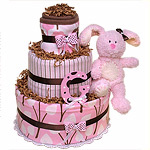 We take great care in sealing and packaging our cakes to insure that all cakes look great when delivered and all diapers are clean and ready to use. It is very easy to disasemble our cakes for actual use of all included items. All diaper cakes from Diapercakesmall.com are carefully packed and secured in high quality shipping boxes to ensure best possible look right out of the packaging. 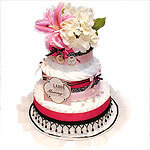 You should be able to enjoy all the beauty of our high quality diapercakes right out of the box.